There are two things I have found that quickly turn a house into a home: hanging art on the walls, and adding the finishing touch to windows by way of curtains. Lucky for us, we had a plethora of curtain options at our disposal for f-r-e-e thanks to our many-windowed Kansas bungalow (seriously, that place had no less than fifteen windows, most of which were dressed), so we pulled many of them out of storage and put them to work. First up, the bedroom. This addition was one of the first things we tackled after moving in last May. I don’t want the neighbors spying on me pulling on my PJ’s every night or getting ready every morning, thankyouverymuch. I like waking up with the light (getting out of bed in a dark room is almost impossible for me) so I thought going light with the curtains would be a great strategy. The heavier black iron-look curtain rod (here) helps polish things off, and the simple ring finials are so chic. The masculine rod balances the subtle feminine flower pattern in the curtains. We previously used these in the guest room in our Kansas house. Discontinued IEKA; we got these on clearance over two years ago. Secondly, the living room. I wanted something navy to go go across the room of our dark teak credenza. The carpet and walls in the living room are really light and I thought that dark curtains would look really chic. These are the only curtains that we didn’t already have. I found this great fabric at IKEA that had an interesting pattern that I liked, and was pretty masculine so Doug was pretty excited. I flexed my long-dormant sewing muscle and whipped these up in about two hours. I’d like to add a lining and they are currently hemmed with pins, because I am debating if I like the one-to-two inch pool or if I want them to be a touch shorter. What do you think? The office. Or guest room. Or catch-all room. No photographic evidence, sorry! We recently installed organizational shelving in here and it now houses all of our books and media. Curtains will protect them from the UV rays which can/will yellow the pages. This room gets amazing afternoon light and will be where I shoot most of the items for my Etsy store. I don’t want anything with a strong color distorting the sunlight, though. We grabbed a pretty silver rod from Home Depot’s Home Decorator Collection, which proved to be much easier to install than the Lowe’s Allen + Roth curtain rods we’d bought previously (note to self). 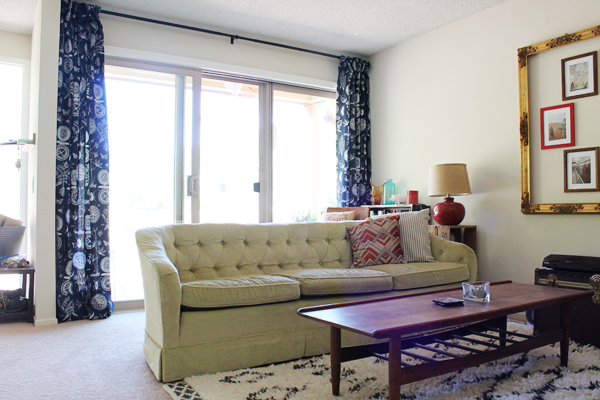 We slapped up two cream-colored Chesapeake curtains from Target that we already had on hand from our old bedroom. Perfection! The dining room was the last room to be curtain-ed, but I’m really, really happy to be able to use the now discontinued green vine IKEA panels. I didn’t even realize it until we hung them up, but the tree outside has red berries on it just like the pattern in the curtain panels. We used the KVARTAL system by IKEA which was surprisingly easy to put up. I was worried about sturdiness but I’m happy to report that it’s really much more heavy duty than I expected. We don’t close these much anyway, so it’s really mostly for looks, and the room seems much warmer with them up. Looks great!! All the rooms really do look inviting. The dining room looks so good. The green and red on the curtain makes the room so lively. Hi Staci! I love your use of color in your dining room! Where did you find the red candlesticks? I love them? Thanks! They are from Crate and Barrel a couple of years ago.